The organizing committee of the eGovernment Excellence Award 2019 announces the launch of the award in its 10th edition, held under the patronage of His Highness Shaikh Mohammed bin Mubarak AlKhalifa, Deputy Prime Minister, Chairman of the Supreme Committee for Information & Communication Technology. The award is open to public and private entities, individuals and NGOs to electronically submit their nominations via www.egovaward.bh starting from today up to 28th February, 2019. The award continues at its 10th edition to highlight unique projects and initiatives; innovative leading concepts in the ICT and eGovernment sectors along with its adoption of standards that reflect the delivery of better services to citizens and beneficiaries contributing to the development of the eGovernment and achievement of the Economic Vision 2030. On such occasion, Information & eGovernment Authority (iGA) Chief Executive Mr. Mohamed Ali AlQaed stated that the Authority’s emphasizes on supporting ICT initiatives at all its sectors is a result of its direction towards strengthening innovation and creative concepts, that keep abreast with the information era and knowledge economy leading to transformation in the eGovernment and all other sectors urging all public and private entities, entrepreneurs, NGOs and citizens to participate in the award. Mr. AlQaed further elaborated on the Organizing Committee’s keenness in enabling the participants to submit in the award by conducting awareness sessions to provide an overview on the requirements and standards along with the mechanism of submission. The Jury Committee evaluating the submissions will consist of experts from Bahrain, the GCC and internationals professionals whom will be announced shortly. It is worth noting that a new addition to the private sector has been added in this year’s edition noted as the ‘Best eService’ for the private entities and entrepreneurs focusing on the service delivered. 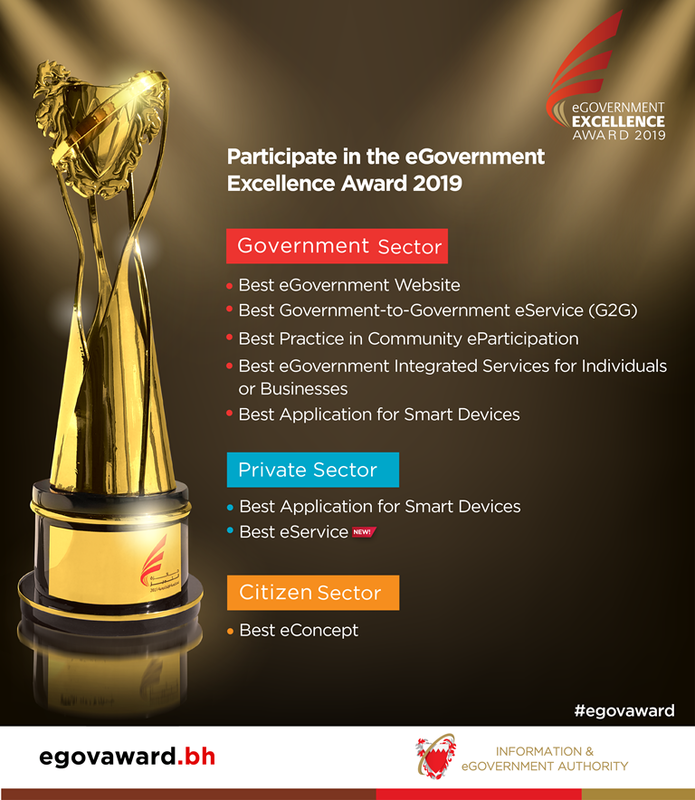 Awarding categories for this year’s 2019 Government Awards comprise ‘Best eGovernment Website’, ‘Best Government-to-Government eService (G2G)’, ‘Best Practice in Community eParticipation’, ‘Best eGovernment Integrated Services for Individuals or Businesses’ along with ‘Best Application for Smart Devices’. While the Private Sector Awards include ‘Best Application for Smart Devices’ together with the newly-added award ‘Best eService’. The Citizens Awards category includes ‘Best eConcept’. For more details or enquiries, please visit award’s website www.egovaward.bh or contact us via the National Contact Center on 8000 8001 or email [email protected].